MARS-1 (aka Mario Martinez) is a left-handed artist who spends most of his time in the right side of his brain, communicating through a visual language. His unique imagery explores possibilities of otherworldly existence through highly developed, multi-layered landscapes. Often employing a fuzzy-logic aesthetic, Mars-1’s artwork has a sentient appearance, like a tulpa—which in mysticism, is the concept of a materialized thought that manifests into physical form. 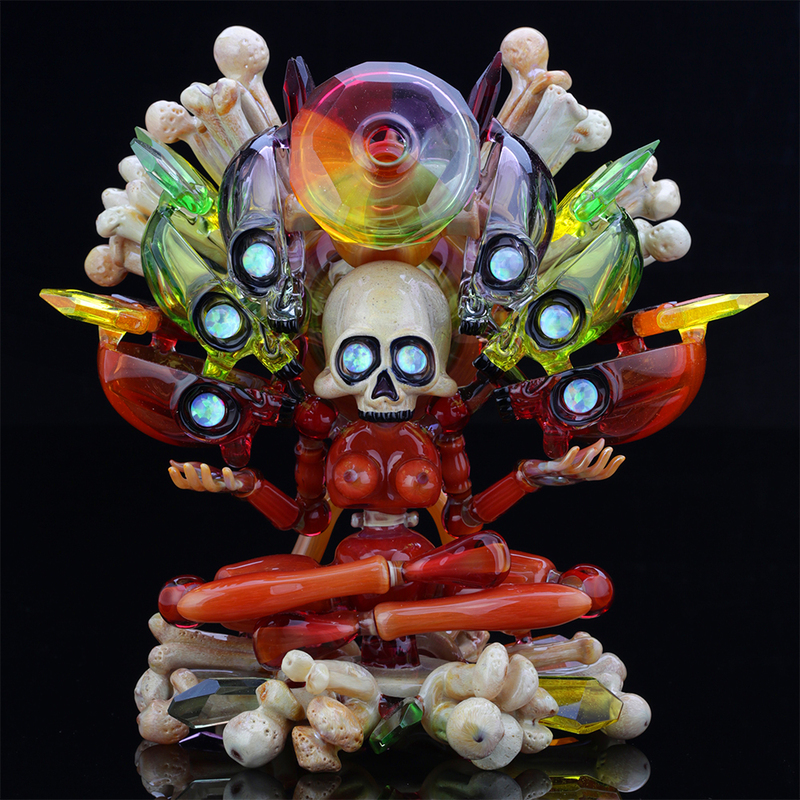 His unique style has been described as urban-Gothic, sci-fi abstracted, quasi-organic form. Early inspirations include: graffiti, animation, comic book characters, ufology, extraterrestrials, unexplored life, mysteries of the universe, alternate realities and the abstract quality of existence. At the age of 13, Mars-1 began writing graffiti in his hometown of Fresno. He later attended Academy of Art in San Francisco, where he currently lives and works, remaining heavily active in the city’s contemporary art scene. The true meaning of Mars-1’s imagery is ultimately left to the viewer’s interpretation. The artist feels this brings his creations full-circle, encouraging his audience not only to decipher the messages he wishes to convey but to receive thoughts and ideas of their own, as well. Graduating with a BFA in painting from the University of Georgia in 2012 where she thereafter moved to New York to be an artist. In 2015, she was commissioned to do several works of art for musician B.o.B where she quit her full-time job to focus solely on her own painting. Now married to fellow artist, Jean Pierre Arboleda, the two painters work passionately to call attention to industry, its effects on our psyche and the living world around us. My abstract animations investigate the metaphysical features of reality. They are designed to stimulate archetypal associations and invite the viewer to make personal connections to the visual and auditory experience without any reliance on narrative or spoken language. 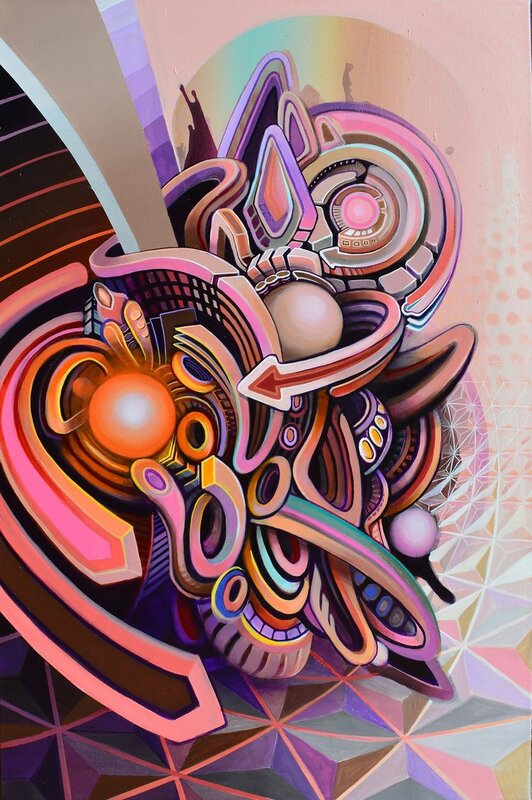 Jake Amason is an acrylic painter from Denver, Colorado. He studied computer graphics and 3D animation for several years before deciding to drop out because of a new addiction to paint arising from long render times that consumed his slow computer. Jake considers Photoshop to be his art teacher and taught him a visual language that prepared him for traditional media. Through sculpting in 3D programs such as Maya, Cinema 4D and ZBrush, he gained experience manipulating massive dimensional virtual worlds compressed into a two-dimensional plane before ever touching the canvas. These environmental textures and understanding of dramatic depth are used in rhythmic patterns to direct the eye through the space over time to animate a still image. While it usually comes out as spacescapes infused with light-emitting geometry, or otherworldly organic forms meeting future machinery, my work is simply about finding balance between all. Imagination can be the same as experience on canvas, which is why music is one of my biggest inspirations. If you listen close enough, sound takes the most lovely shapes and colors. I’ll always enjoy the experience of painting at shows. The energy and interaction is what art is all about to me… So let’s talk sometime. David Fratu (aka ILL.DES) is an artist living and working in Atlanta, GA. His style of painting represents a balance between chaos and order. Using gradients of color and intricate patterns, he creates a sense of depth and movement. Viewers are drawn into his illusive designs filled with vibrant colors, geometric shapes, and organic line work. Together, his unique symmetrical compositions form a perfect equilibrium of harmony and discord. Through my artwork, I wish to remind people of their innate child-like sense of wonder and whimsy. Though we are consistently growing through adult experiences that can test the strength of our imaginations and dim the light from within, we are able to access that playfulness, especially through art and music. Music was my first love, and being able to experiment with painting live helped me discover my path as an artist. I love to interact and paint around people, and to paint certain colors associated with certain sounds and instruments. I enjoy being able to provide visual recordings of an experience. After experiencing it, I consider live art to be incredibly interactive with the musicians, the fans, fellow artists, and the overall scene. That, to me, is the most pure form of joy. Nothing warms me more than seeing a community resort to just being happy together, and I wish to act as a catalyst and convey that energy to all others. Inspiration from my art comes from childhood folklore, bright and vibrant colors, nature, femininity, and of course, music. I hope and wish to inspire all to be truthful and courageous with themselves and what makes them whole. In this way, they may create the way they are born to be, and can inspire to build bigger platforms for others to do the same.